(Millbrook, NY) Pacific salmon and trout are vulnerable to infectious hematopoietic necrosis virus (IHNV), a pathogen that can be lethal to juvenile fish. A recent Ecology and Evolution study is the first to explore how IHNV spreads among juvenile hatchery-raised fish in the Pacific Northwest, where high rates of infection and mortality can occur. 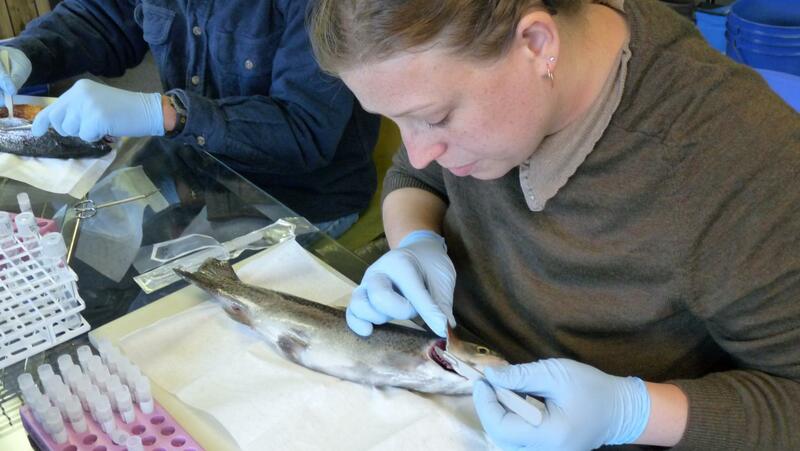 Cary Institute disease ecologist and coauthor Shannon LaDeau explains, "IHNV is the most significant viral pathogen of Pacific salmon and trout in North America and has likely been present in Pacific salmon for thousands of years. However, ecosystem alterations and human activities have impacted its spread, especially in cultured fish populations." Gael Kurath, senior research microbiologist with the USGS Western Fisheries Research Center and coauthor on the paper notes, "IHNV disease costs Pacific Northwest conservation efforts and the global aquaculture industry millions of dollars annually. These expenses include direct losses due to fish mortality or culling of infected fish and eggs, costs of routine surveillance and testing, and program losses due to restrictions of movement of infected fish. Studying viral transmission in hatchery-reared fish presents unique challenges. Author Rachel Breyta, now at Oregon State University, led the study while a Postdoctoral Fellow at the Cary Institute. She explains, "While hatcheries can be disinfected and controlled, juveniles migrate to the Pacific Ocean as part of their life cycle. When they return to hatcheries to spawn as adults, complicating variables – such as swimming through IHNV-infested waters – come into play." IHNV is quick to evolve, allowing it to adapt to the host fish's immune system as well as to new environments and host species. Infected fish shed the virus into the water, where it can survive long enough to infect new fish hosts. Juvenile fish can also contract the virus through transmission from parent to offspring via infectious reproductive fluids. Some 65% of IHNV-positive samples were analyzed by viral genetic analysis, with 90 distinct genotypes identified. This information was used to trace three potential viral transmission pathways: from juveniles to juveniles in the same hatchery site, from juveniles at one hatchery to juveniles at another hatchery, and from infected adults returning to their 'home' hatchery site to juveniles at that site. Breyta explains, "By identifying the strain of the virus infecting a fish and cross-referencing this information with known locations of different IHNV strains across the landscape, we can map where a fish became infected, the potential transmission pathway, and other locations at risk of IHNV outbreaks." "Infected juvenile fish and infected migrating adult fish are likely to play important roles in spreading IHNV," LaDeau explains. "We expect that our efforts to better understand viral transmission will lead to more targeted management strategies. Disrupting transmission is key to stopping the expansion of this virus, which is a conservation threat and an economic liability."